Let others feel special with this Sweetly Stunning Red Roses Bouquet on special days of celebrations. The best way to send a smile for any spring celebration, choose a gathering of 15 Red Rose with Filler Flowers decorated with matching Tissue and exclusive Ribbon. Let others feel special with this Sweetly Stunning Red Roses Bouquet on special days of celebrations. The best way to send a smile for any spring celebration, choose a gathering of 18 Red Rose with Filler Flowers decorated with matching Tissue and exclusive Ribbon. 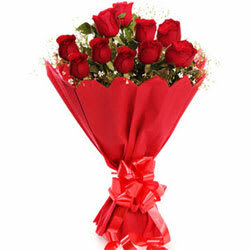 Let others feel special with this Sweetly Stunning Red Roses Bouquet on special days of celebrations. The best way to send a smile for any spring celebration, choose a gathering of 24 Red Rose with Filler Flowers decorated with matching Tissue and exclusive Ribbon. Let others feel special with this Sweetly Stunning Red Roses Bouquet on special days of celebrations. The best way to send a smile for any spring celebration, choose a gathering of 36 Red Rose with Filler Flowers decorated with matching Tissue and exclusive Ribbon.